We thought it was just the Technic sets that Toys R Us put up on their online store, but after much searching on their page, they have also listed nearly the entire line of Creator sets for 2015. Another whoops advance view of what is to come in 2015. 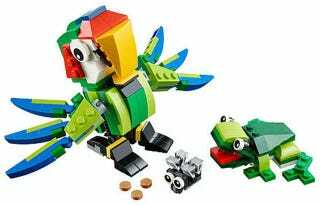 Rainforest Animals (31031) - Probably the coolest of these sets, pictured above, this 215 piece set is a 3 in 1, with a lizard and a piranha as the optional models. Blue Racer (31027) - Also a 3 in 1 model, coming in a 67 elements this is a fun little set for the Autocrosser in your life. Cargo Helicopter (31029) - Another 3 in 1 at 132 elements and one of those rare times where the tertiary model, a container ship, is actually the best one. Red Creatures (31032) - At 221 pieces, this is a really great set. It is a perfect addition to Ferocious Creatures (5868) from 2010. Green vs. Red dragon sounds like a great idea. Sea Plane (31028) - Another super small 3 in 1. At 53 elements you get a lot of tiny plane adventure packed into one $5 package. Vehicle Transporter (31033) - Pretty close to Construction Hauler (31005) from 2013, but with a couple cars instead in this 264 element set. Snowplow Truck (60083) - The only City set that they put up. This minifigure scale, 196 element, Unimogesque snowplow has to be one of the coolest small sets in the City line.